We often put a twist into songs or adapt them so that it reinforces our questions or the vocabulary that we have been covering. When we sing Au Feu les Pompiers we replace the cantinier and the cantinière with the children’s names! They really laugh a lot when we do this. I hope they’ve been singing it at home with you. We sometimes add extra songs to our lesson plans that may not be in your newsletter if the children enjoy a particular word. The children have particularly enjoyed the word ‘le Pompier [leuh pomp-ee-ay] ‘, which means fireman…they may have even been singing pin-pon-pin-pon [pahn-pohn] around the house! That’s the noise that the firetruck ‘camion de pompier’ [cam-ee-ohn deuh pomp-ee-ay] makes! 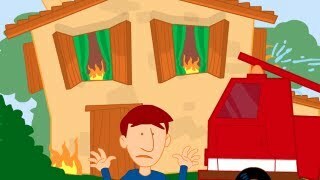 Au feu les pompiers is all about the firemen being called to a fire…Here’s a translation to help you whilst you listen to the video clip. These video clips are great as you can follow the words as they are sung. V’là la maison brulée…here’s the burnt house! Have fun! It’s what makes language learning enjoyable and it’s the best way for your children to remember the vocabulary.